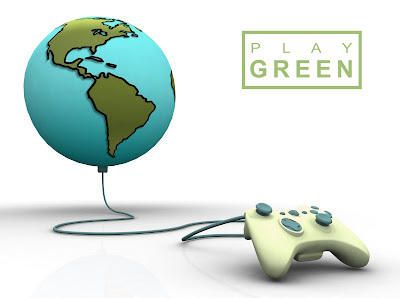 Play Green - Can gaming have a larger social purpose? WARNING - Allowing children to watch TV could turn them into animators! Growing up my mother had few rules and was lenient when it came to my consumption of television. Thank goodness! As long as the grades were exceptional (I'm Chinese, good is just not good enough) I could just about watch anything. Being a little geek, I was less interested in the Super Friends and more interested in School House Rocks. Thanks to my healthy appetite for TV, after doing the 'right' thing and completing a noble education in architecture, I did the old head fake and fooled my family into letting me become an animator. I traded my Auto CAD for Softimage and my black turtleneck for a hoodie. I spent the first decade of my career learning the production floor from the ground up at the legendary Mainframe Entertainment while simultaneously teaching at (what I think is one of the best CG schools in the world), Vancouver Film School, aka VFS. In that time I've honed my people skills and ability to guide a project, be it studio or student, from the idea stage to completion. My latest project, laneway, was funded by the Canada Council for the Arts and represents the more independent side of my work. If you're into architecture, design and animation in the form of a short documentary then check it out. I'm really proud of this project and think the designers who built the house are onto something. In the development tank here at twixt we're breeding some wild animals and feeding them a healthy staple of animation, while hatching our next scheme in the form of a book. More on that in the future so stayed tuned and thanks for stopping by. Welcome to my blog! I’m Casey Kwan, a designer and filmmaker living in Vancouver, Canada. I work in tv, films and games as an art director, cg supervisor and teacher. I set up twixt media as an outlet to pursue my passion for architecture and design, be it real or imagined. Currently, I'm working on 'cargo house' and looking to land my next gig in the world of video games.